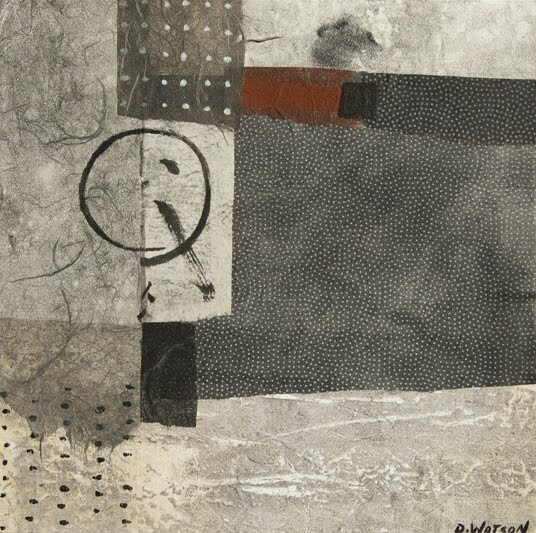 The above collage is the beginning of my Enso series. Enso represents the Japanese circle, and my search for completeness. 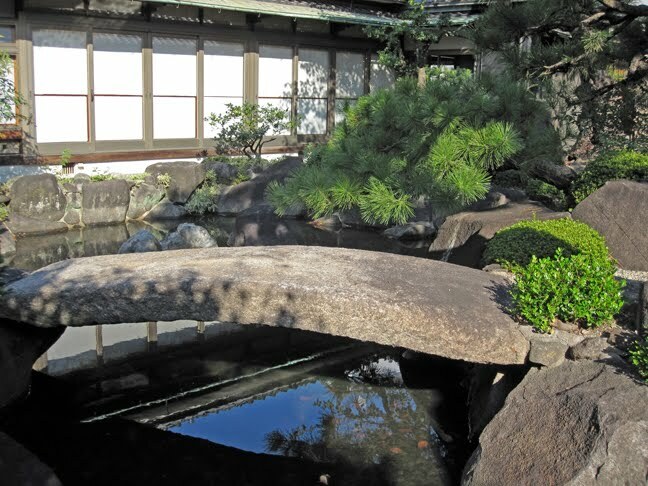 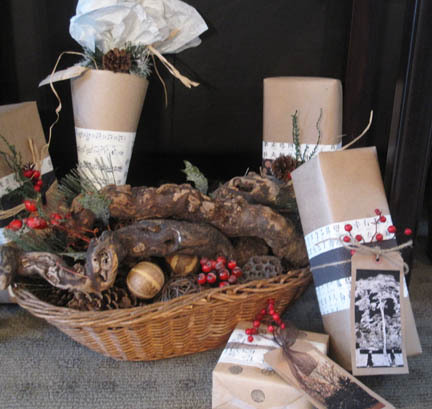 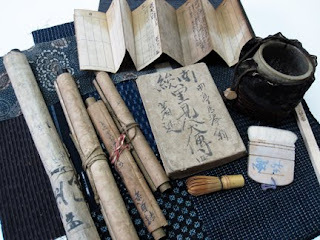 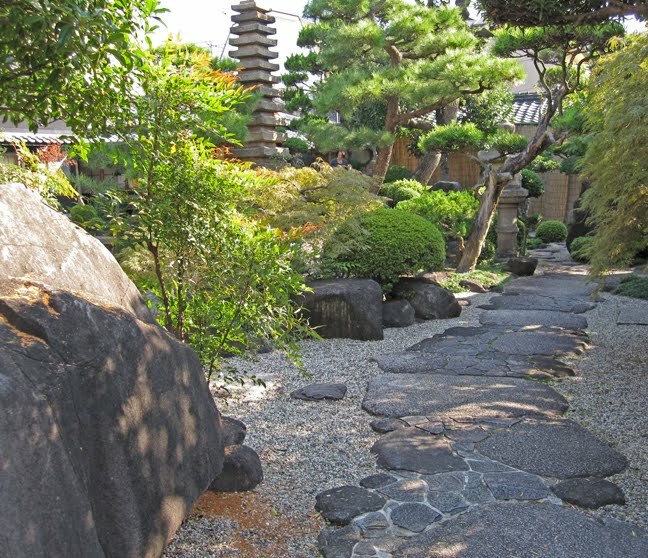 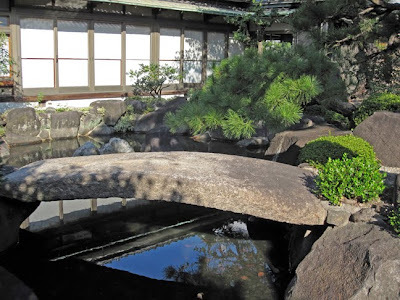 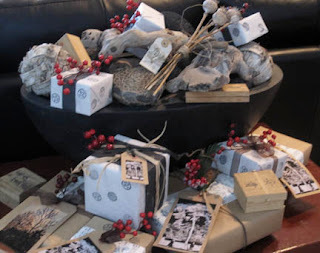 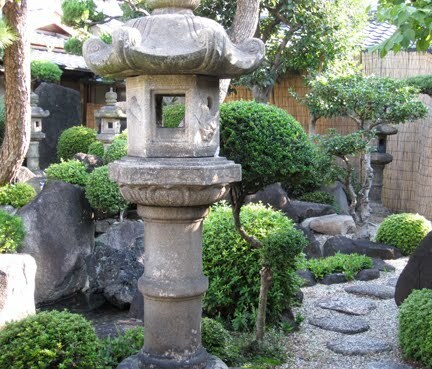 There are also aspects of the placement of handmade papers (like setting stones in a Japanese garden) and Boro. 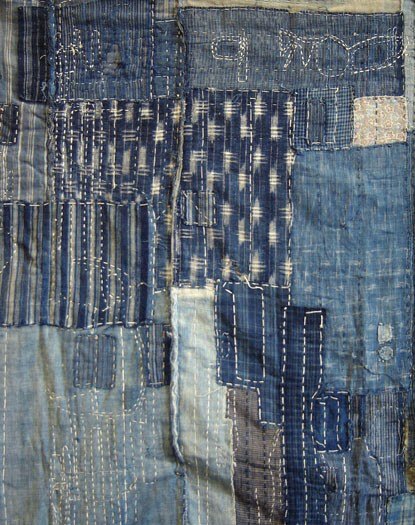 My interpretation of Boro in my work involves hand-painted rice papers placed in a quilt-like fashion using my sense of balance, contrast and unity. 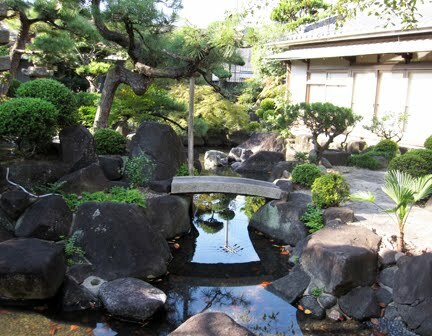 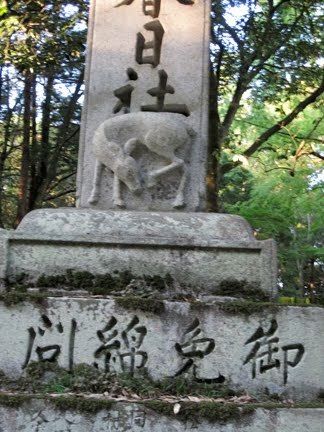 Recently, the Japanese Gardens in Portland Oregon hosted a show of Boro. 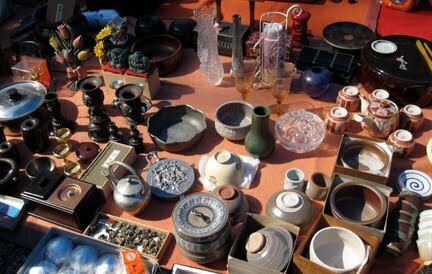 They called the show MOTTAINAI which means 'waste nothing' in Japan. Many years ago, the very poorest people in Japan saved every scrap of cloth, thread, paper and patched or quilted 2nd hand cotton garments from city dwellers who traded for rice or vegetables. Two of the biggest collectors of Boro in the world sent samples of their Boro collection to the Portland exhibit. 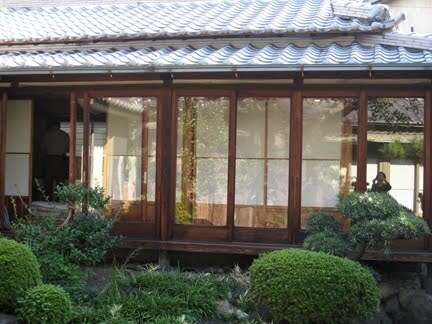 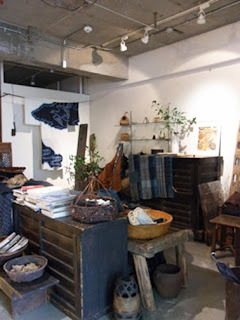 One of the biggest collectors of Boro in the world has a gallery and showroom/shop in Kyoto on Teramachi Street. 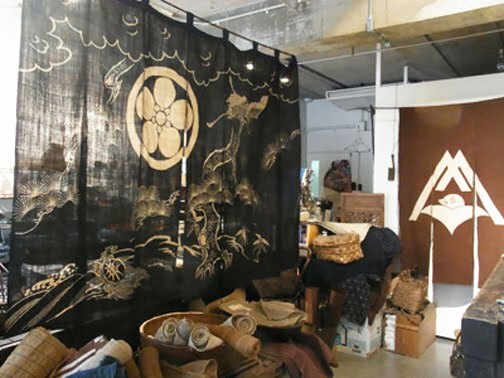 Her name is Kei Kawasaki and you can find her website here. 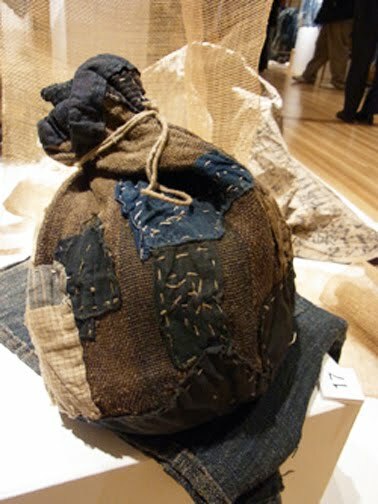 These very poor Japanese people in pre-industrial Japan would patch together bits of cloth out of necessity. 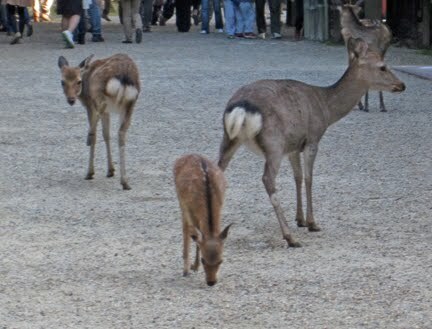 Every small patch was like treasure to them. 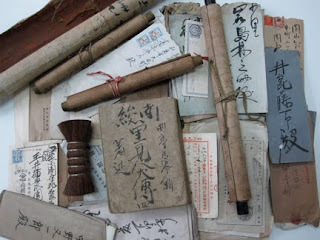 the story as it tells. 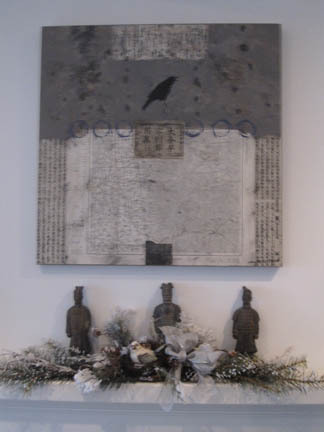 The other collector of Boro is Stephen Szczepanek, who also participated in the Portland exhibit. 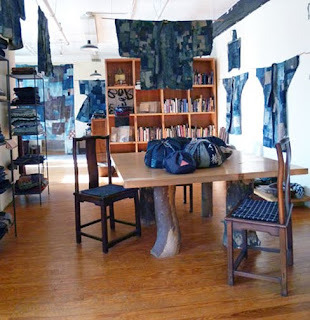 This is his showroom in Brooklyn, NY. You can find his blog here. 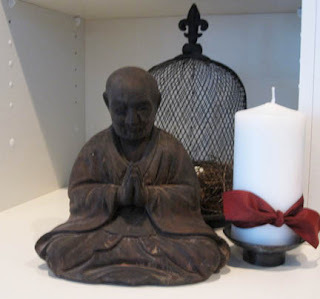 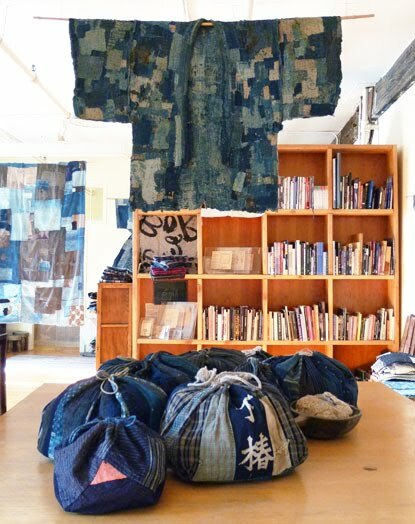 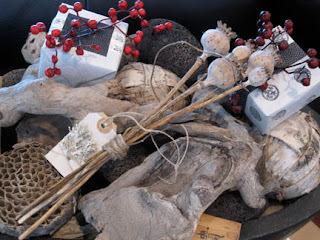 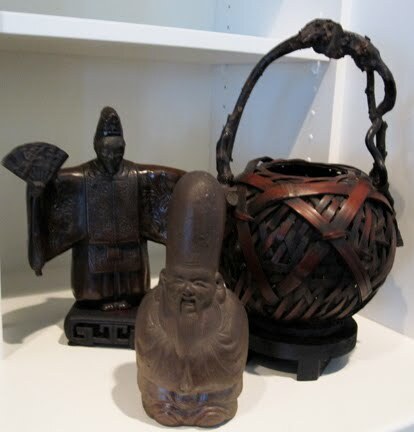 His website is called Sri and he is very well known in the Boro and Japanese Textile world. 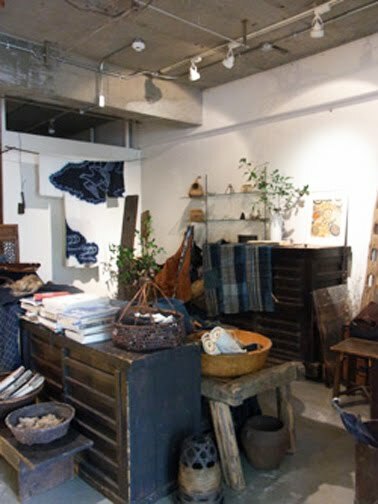 In his showroom above, a workcoat called boro noragi, is patched with pieces of cloth as small as a postage stamp. 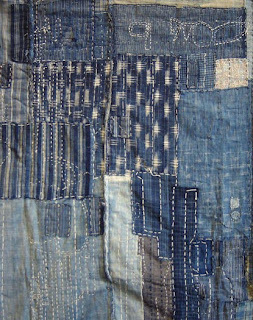 Here you can see an example of the intricate stitching used in Boro patching. 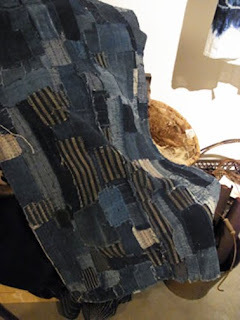 The Japanese people created these quilted clothing out of necessity. 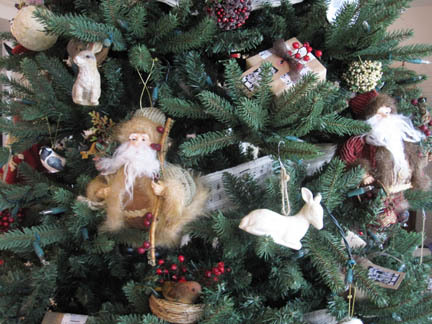 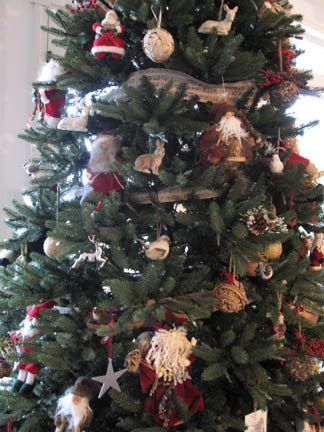 Of course they did not know that someday their old, patched and quilted items would become treasured and exhibited in galleries, showrooms and museum exhibits. Above is some indigo dye... 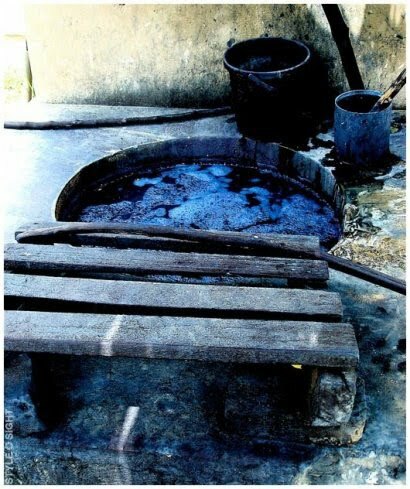 I read that the Japanese used indigo... especially firemen and their work jackets... because indigo fabric will not burn. 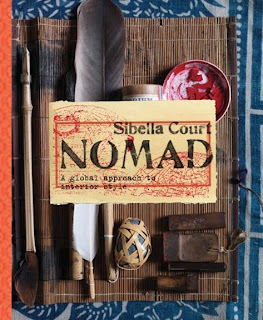 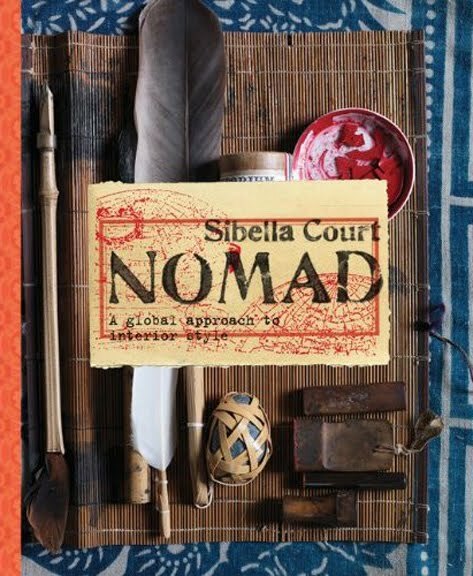 And finally, Sibella Court has a new book: NOMAD, A global approach to interior style. 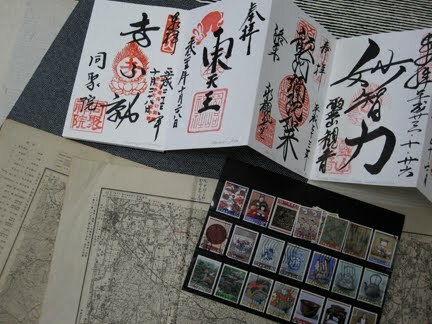 I have received my copy and it is wonderful with a beautiful chapter on Japan. The book is available at Amazon.com and Anthropologie.com. 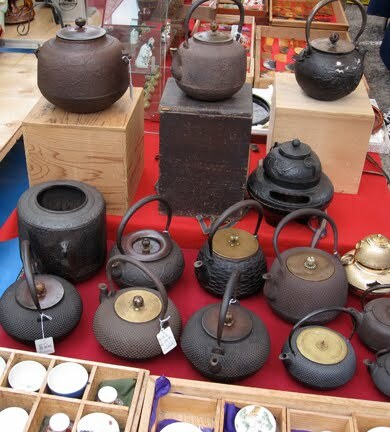 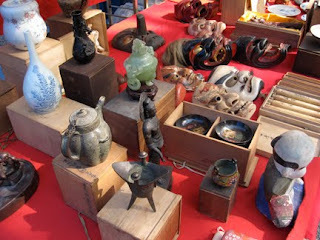 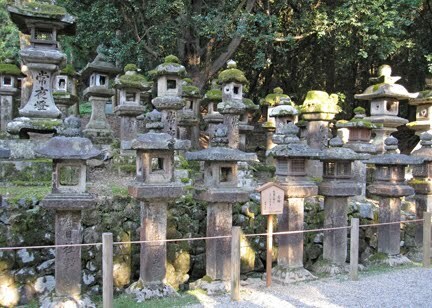 In Kyoto, the Kobo-san market fair is held on the 21st of each month on the grounds of the To-ji temple and pagoda. 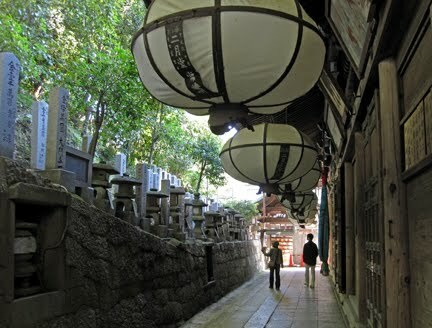 This temple was established in 794 by imperial decree to protect the city. 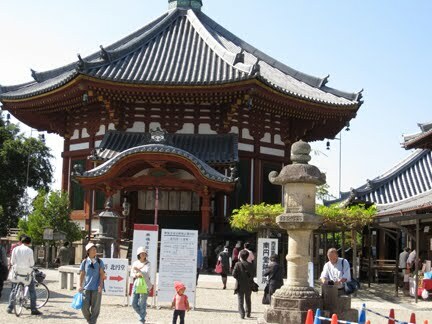 Many of the temple buildings were destroyed by fire during the 15th century but has been rebuilt in the 1600's. The temple flea markets are gigantic... booth after booth of antiques, textiles, collectibles, scrolls, pottery and books. The Tenjin-san Market is held on the 25th of each month on the grounds of the Kitano Tenman-Gu shrine. 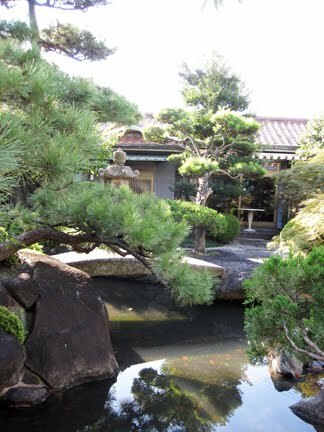 The shrine was established in 947 and rebuilt in 1607. Above are a few flea market finds for my home. 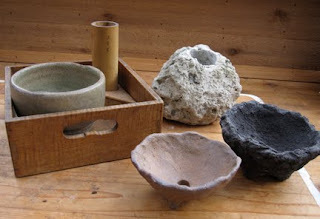 Above are flea market finds for my greenhouse, waiting for spring. Some finds for the garden and greenhouse. That piece of bamboo is called Turtleback bamboo. 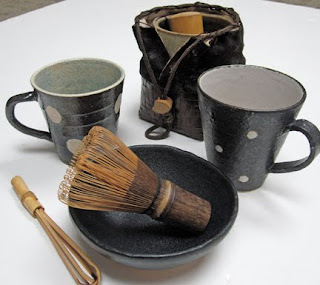 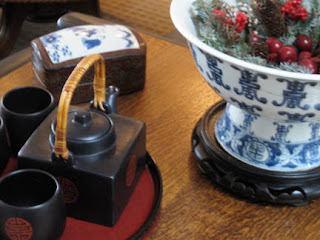 I found some tea cups with dots, and a small basket with cloth top with tea cup and tea tools, used as a bag to travel with. 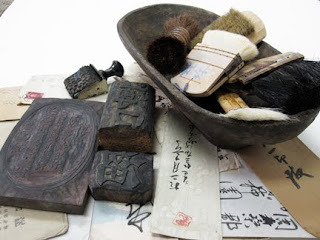 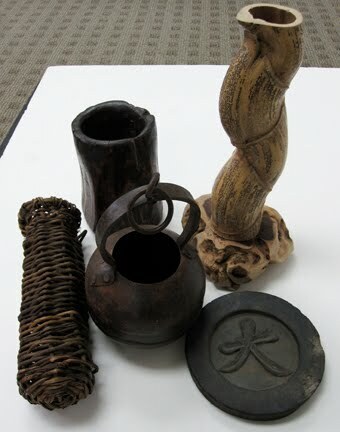 Above are some wooden stamps, old envelopes, some old brushes, and a wonderful hand carved wooden bowl. 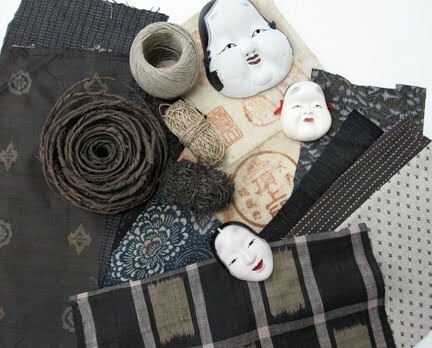 Above are some of the old kimono fabrics I found, with some threads and yarn, an old pilgrimage belt with old seals, and some Otafuku faces for my collection. 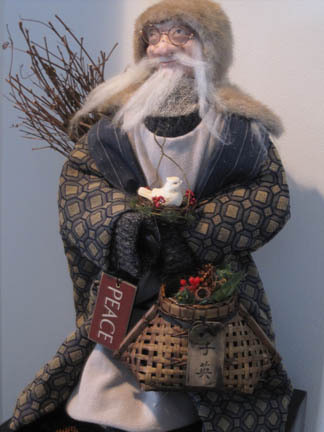 Otafuku dolls and faces are of a mythic figure in Japanese folklore. 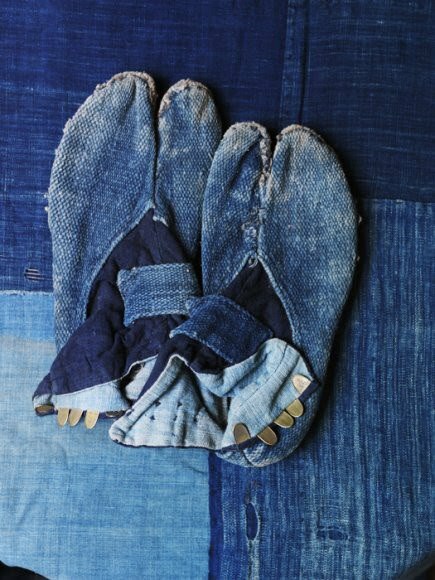 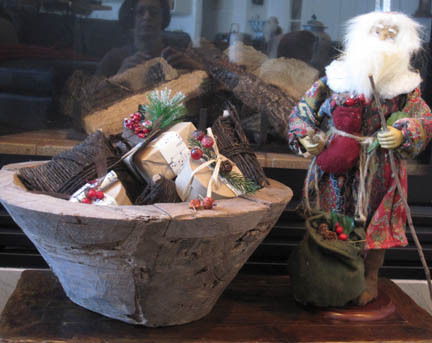 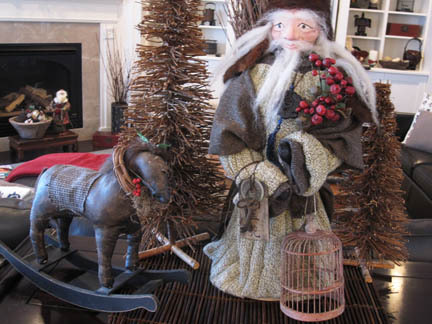 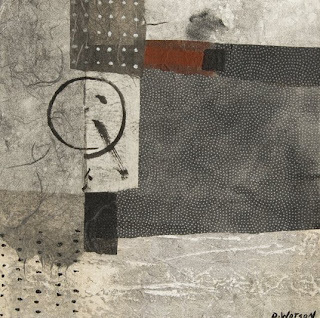 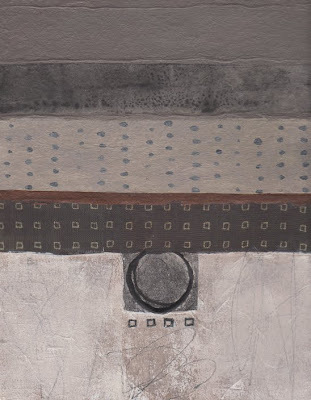 She turns up on textiles, pottery, dishes, folkart, painting and sculpture. 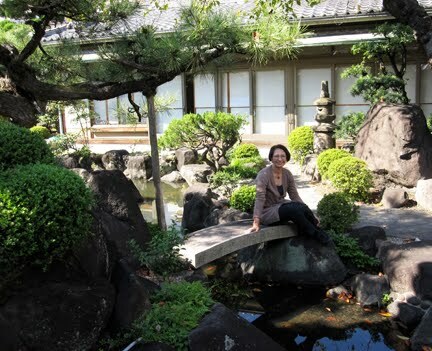 She is every woman, generous, the essence of goodwill. 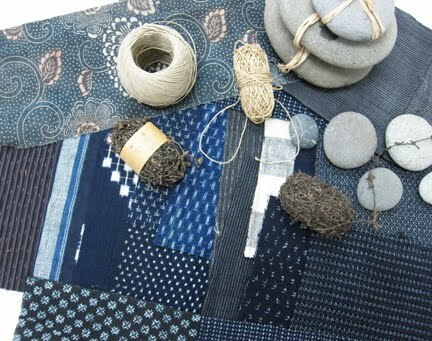 Here are some of the indigo Boro fabrics I found with string and yarn. 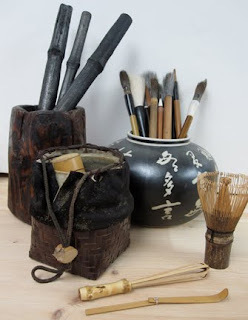 I found some old scrolls, old books, and brushes. Here is a small sample of the old envelopes and papers I found. I came home with some old Japanese maps, rice papers, and a wonderful packet of old stamps. 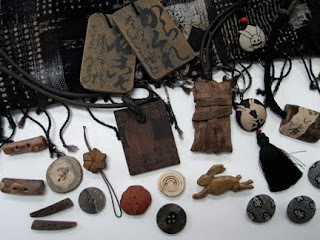 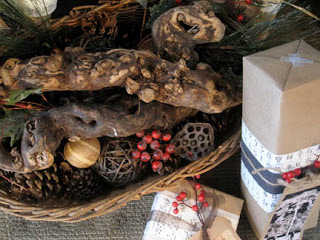 I found some wonderful scarves, necklaces and hand carved wooden buttons and cloth buttons. Do you see the hand carved wooden rabbit pin? stone awakening, depths opening to you.